Harlequin ichthyosis is a severe genetic disorder that mainly affects the skin. Infants with this condition are born with very hard, thick skin covering most of their bodies. The skin forms large, diamond-shaped plates that are separated by deep cracks (fissures). These skin abnormalities affect the shape of the eyelids, nose, mouth, and ears, and limit movement of the arms and legs. Restricted movement of the chest can lead to breathing difficulties and respiratory failure. The skin normally forms a protective barrier between the body and its surrounding environment. The skin abnormalities associated with harlequin ichthyosis disrupt this barrier, making it more difficult for affected infants to control water loss, regulate their body temperature, and fight infections. Infants with harlequin ichthyosis often experience an excessive loss of fluids (dehydration) and develop life-threatening infections in the first few weeks of life. It used to be very rare for affected infants to survive the newborn period. However, with intensive medical support and improved treatment, people with this disorder now have a better chance of living into childhood and adolescence. How common is harlequin ichthyosis? 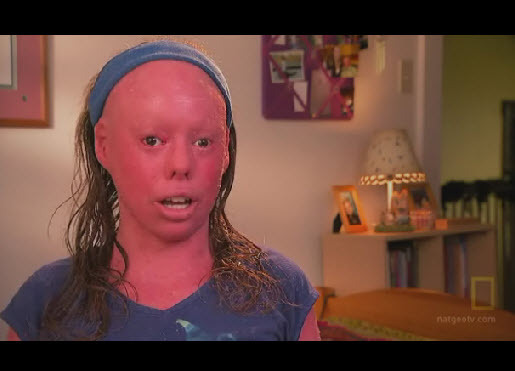 Harlequin ichthyosis is very rare; its exact incidence is unknown. Where can I find additional information about harlequin ichthyosis? You may find the following resources about harlequin ichthyosis helpful. These materials are written for the general public. What other names do people use for harlequin ichthyosis?